American Destroyers: Tier II Sampson, Tier III Wickes. Torpedo range has been increased from 4.5 to 5 km. These changes will balance these destroyers with other ships in this Tech Tree possessing similar stats. American Cruiser: Tier III St Louis. The sigma of all guns has been decreased from 2 to 1.8. Reload time of researchable guns has been increased from 8 to 9 seconds. Large HP, high accuracy and 152 mm guns made this ship one of the most efficient at it's tier. 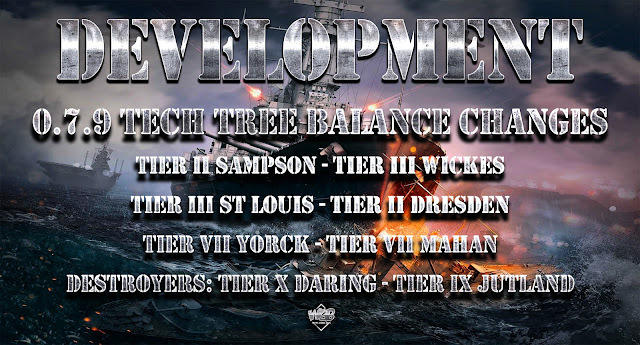 These changes are aimed to balance St. Louis with other ships at this level. German Cruiser: Tier II Dresden. Reload time of guns has been increased from 4 to 5 seconds. This cruiser has a pretty high level of damage per minute. Changing this parameter will balance this cruiser in the line with other ships of this tier. German Cruiser: Tier VII Yorck. The shell velocity of high-explosive and armor-piercing shells to travel 10km has been reduced from 5.65 and 6.72 seconds to 5.09 and 5.14 seconds relatively. AP shells damage has been increased from 5500 to 5600. These changes will align Yorck's ballistics with other ships in the Tech Tree and highlight the effectiveness of AP shells of German ships. American Destroyer: Tier VII Mahan. Initial surface detectability range reduced from 7.92 to 7.64 km. The detectability after firing in smoke has been reduced: from 2.98 to 2.86. These changes are valid for all hulls and the main goal is to increase the efficiency of this destroyer in a melee battle, where Mahan can perform very well. The detectability radius of this destroyer didn’t allow it to fulfill its intended role in a battle and this adjustment brings it in the line with other ships of Mahan’s Tier. British Destroyers: Tier X Daring, Tier IX Jutland. Main battery has been changed from 114 mm to 113 mm. These changes have been made for historical accuracy.